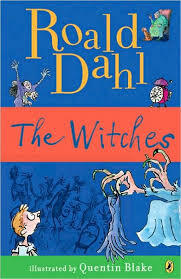 This Roald Dahl classic tells the scary, funny and imaginative tale of a seven-year-old boy who has a run-in with some real-life witches. We have all read fairy tales about witches, haven’t we? Witches that wear silly black hats, black cloaks and ride broomsticks. Well, that is why they are called fairy tales. This story is about real witches. You see, real witches are all around us, looking just like us. It might be your pretty school teacher, or that friendly lady in the supermarket or even your mother( I always add that when I read it to daughter, and the first time I did it, she did get a little scared). The witches in the story are evil women who lead totally normal everyday lives, with little to tell you their real identity. And they HATE children. A little boy goes to Norway to live with his grandmother after his parents die in an accident. He adores his grandmother, and in some ways was closer to his grandmother than his own mother. In order to keep the sadness away, she starts telling him stories. The Grandmother is a wonderful storyteller, and all her tales kept the boy, rapt. However the stories that he was completely enthralled with, were those about witches. Now, the grandmother was a retired witch hunter. She was one of the few people who knows all about witches and of how to identify them. All the stories of the witches that she told him were real tales, cautionary tales so that he knew what to do in case he ever encountered witches. Now, the thing about real witches is, that you can’t figure out who is a witch and who isn’t. They hate children, the smell of children is like stink for the witches. Since they hate the ‘children smell’, so grandmother recommended that the boy went without baths, so that his smell could be masked. And she told him a few things that would help him in case he ever met a real witch. They were living happily in Norway, when they got to know that according to the boy’s father’s will, grandmother would be the guardian, but, she would have to bring him up in England, in the house he lived with his parents. Now, Grandmother doesn’t want to leave Norway, but she doesn’t have much of a choice. There is also another reason why England could be more dangerous. Apparently, while Norway had lots of witches, England didn’t have so many, BUT, English witches were the most vicious of them all. They were known to do the cruelest of things to children. The boy would have to be extra careful in England, you never knew when you would come across a really vicious witch. As luck would have it, the boy does run into some witches. Did grandmother’s tales and tricks help him in the end? You’ll have to read to find out, and have a fun time while you are at it. It is a wonderfully funny book. Daughter and I absolutely had a ball, reading it. If you like Roald Dahl’s books, you are sure to like this one too! It might be scary for some children, so I would recommend that you read it first before reading it to your child, or letting them read it. This review has been cross-posted at Indian Moms Connect. Roald Dahl was a British novelist, short story writer,poet and screenwriter who rose to prominence in the 1940′s with works for both children and adults, and became one of the world’s bestselling authors. Dahl has created some of the most loved children’s books ever. This book is available at Amazon and Flipkart. Daughter and I read Matilda together, a couple of years ago. This was one of her first ‘thick’ books and I think she was a little intimidated by the size of it. So I would read it, and leave it at a tantalizing place, and tell her that we would read the rest tomorrow. Now the child engrossed in Matilda’s world would refuse(but, of course) that option, and would beg, ‘Can I please read it myself?’ 🙂 Since then, she has read, reread and re-read them. It never fails to get her to chuckle away. I have to mention here, that I am eternally grateful for the fact that she re-reads her books. There is no way, I would be able to feel her habit, if she didn’t! Matilda is a very intelligent, very smart little girl, who lives with her mother, father and her older brother. By the age of five and a half she is doing maths and reading books which some grown ups might struggle with. Normally, the parents of a child with such exceptional abilities would be amazed and proud of her, and help her achieve her full potential. Normally, for parents even the most annoying child on earth is the most gifted, most talented, most adorable in their eyes. Alas, for Matilda, her parents are just the opposite. They are so self obsessed that they can’t see beyond the tip of their noses. They just did not care about Matilda, at all! Not just that, they are rude and beastly to her. She finds a way to pay them back. Every time they are rude or mean to her, she plays pranks on them. Just her way of getting back at her parents who are so mean to her. Now, Matilda, is not just smart, she is also resourceful. She finds ways of feeding her amazing appetite for knowledge, and soon she is ready for school. Actually more than ready for school, because she knows much more than most children her age, a fact that her parents are blissfully ignorant aboujt. At school, her teacher, Miss Honey is the first grown-up who takes an interest in her, and finds to her amazement, an amazingly talented little girl. Impressed by her knowledge and abilities, Miss Honey, tries to get Matilda into a higher class, more suited to her abilities. She approaches the Head teacher Miss Trunchbull, who, refuses pointblank. Now, Miss Trunchbull is a person who hates children. Most head teachers are selected for understanding children and for having the best of the children’s interest’s at heart. It is a mystery how Miss Trunchbull ever got her job. She is the cruelest person around, and the children live in fear of Miss Trunchbull. Despite Miss Honey’s best efforts, Miss Trunchbull refuses to look at what is best for Matilda. It looks like school is going to be as tough as home for Matilda. The only bright spot in her life is Miss Honey. So how does she fare? Do the evil people around her break her down? You’ve got to read it to find out. But, I can assure you, that you will have a lovely time while you do that. The book, is definitely one of Roald Dahl’s best books. Such a heart-warming tale of a young girl, living a tough life, and finding a way to come out of it. Dahl takes a tough scenario, and uses it to make it one of the most enchanting stories ever. I’m quite sure that children living sad lives might feel a wee bit empowered reading about Matilda. Even other wise, it is a lovely tale. One that makes you smile and cheer for Matilda as she gets the better of the evil people around her. A book that both children and grown-ups are sure to enjoy! I would easily rate it a 5/5. Roald Dahl was a British novelist, short story writer,poet and screenwriter who rose to prominence in the 1940’s with works for both children and adults, and became one of the world’s bestselling authors. 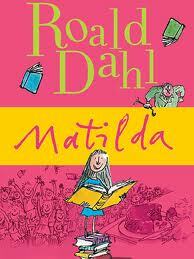 Dahl has created some of the most loved children’s books ever. This book is available from Amazon and Flipkart. This has been cross-posted on Indian Moms Connect(IMC). Do hop over and check out the IMC, an amazing place for all things related to parenting. I don’t normally review children’s books. Mainly because I don’t read as much to daughter any more. She loves reading by herself, and frankly, I like more this way to. I know, lazy me, but it is so much fun for both of us to be lounging on the sofa, or in bed, just before bedtime, completely engrossed in our own books. What Makes a Flower Grow? What’s The Earth Made Of? How does a Bird Fly? We picked it from Bookpeople, about 2 or 3 years ago. I don’t actually remember when, but it has been one of those books that has never gone out of favour with daughter. 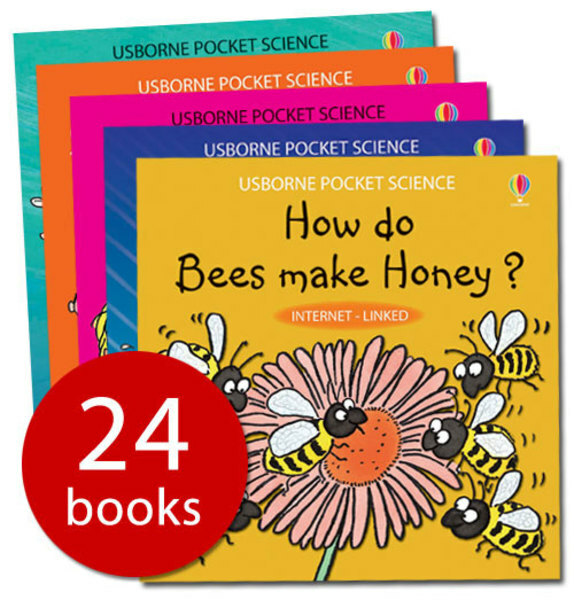 Each topic is handled in a very comprehensive way, while keeping things at a level which makes it easy for a child to understand. I think Daughter was around 5, when she first read it, and the details provided are so interesting, that she still reads them. 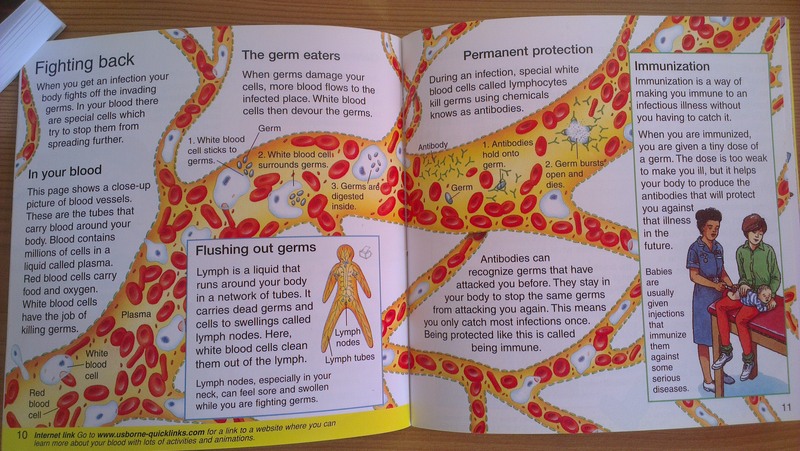 This page in What makes you ill?, for instance, addresses what germs are, and how they impact us, making us ill. The illustrations are really good as well, helping a child visualize something that is not so easy to visualize. Check out this. I particularly liked the book on ‘Where do babies come from?’. It address a topic that most of us worry about discussing with our children. 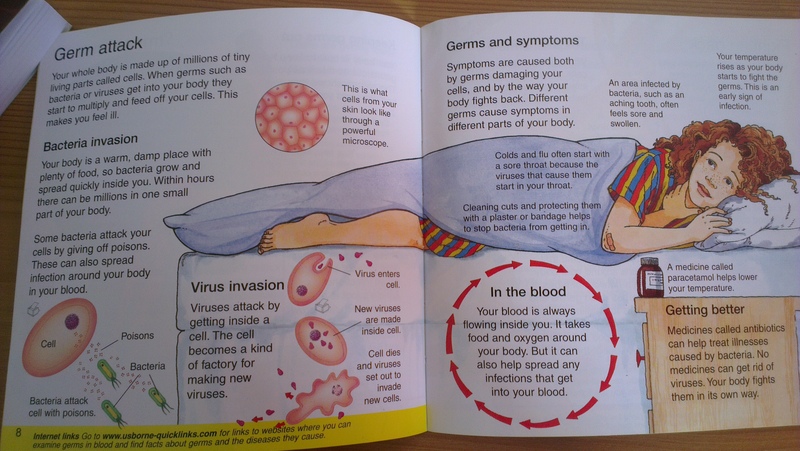 This has some very simple ways of explaining it all, and it seemed to have quenched Daughter’s curiosity. I could go on and on, but then as you can see, there are 24 books. Why go on and go, when I could just tell you to try it out 🙂 We love it, and hope you do too. And I forgot to mention, they are not big or bulky. They are really slim, so I found it very useful to grab a few whenever we are traveling. It really helps because of the wide variety of topics, daughter is never bored. And I can fit them even in my handbag, without breaking my back. What more could I ask for? This review has been cross-posted at the Indian Moms Connect. Do check it out for an amazing spread of parenting resources.